Laura Duncan grew up in Tucson. She played four years of volleyball at Sahuaro High School as well as four years for Zona. Laura graduated in 2015 from Clarion University in Pennsylvania with a degree in Art with a concentration in ceramics. While attending Clarion, she played 4 years on the women's volleyball team as a middle blocker. Her team made it to the Division II NCAA Tournament all four years, finishing in the top 32 in the country. 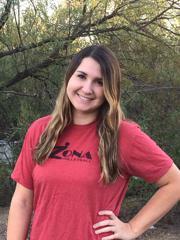 Laura has been coaching with Zona since the 2016 season.